When you get in the shower this morning, wrap your hand around your solid, natural Man Bar, and work up a lather from head to toe. In a few minutes, you'll feel refreshed, confident, and ready to face the world. Our all-in-one, the Ancient Sunrise® Man Bar is great for the gym, air travel, and camping. Women love a solid Ancient Sunrise® Man Bar too. Soap base contains: organic coconut oil, organic olive oil, organic palm oil, organic sunflower oil, and organic shea butter. Bars are hand crafted and hand-cut, so the size varies slightly. Each bar is at least 3.5 oz. Soap base contains: organic coconut oil, organic olive oil, organic palm oil, organic sunflower oil and organic shea butter. Shampoo base contains saponified castor bean oil, organic olive oil, organic sunflower oil, avocado oil and organic coconut oil. Earth Ancient Sunrise® Man Bar - Ingredients include therapeutic grade sandalwood, dragon's blood, patchouli essential oils and champa attar. Espresso Ancient Sunrise® Man Bar - Ingredients include organic espresso coffee and therapeutic grade vetiver essential oil. Pie Ancient Sunrise® Man Bar - Ingredients include organic vanilla extract, therapeutic grade clove, nutmeg, cinnamon and ginger essential oils. 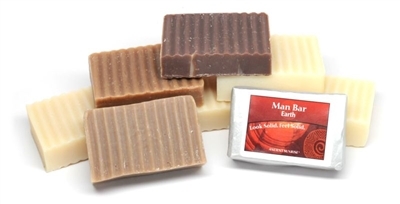 Spice Ancient Sunrise® Man Bar - Ingredients include therapeutic grade clove, black pepper, bay leaf, nutmeg, ginger and cedarwood essential oils.